Californian power company eSolar, which is focussed on building small-scale solar power plants, has raised $130 million in funding including $10 million capital from Google’s philanthropic arm, Google.org. eSolar said it would use the money from Google.org, Idealab and Oak Investment Partners to make and install pre-fabricated solar-thermal power plants near towns and cities. The company said its plants will generate up to 33 megawatts, typically enough power for up to 25,000 California homes, and that several of these plants could be connected to create a larger facility. Solar thermal systems differ from traditional solar panel plants in that they collect heat from the sun and use it to boil water into steam, which spins a turbine to create power. One advantage of solar thermal systems is that the heat can be stored for hours, or even days, improving the plant’s ability to generate energy “on demand”. It’s terrific to see some serious backing of a company driven to make a business of renewable energy, but one question comes to mind — is this an investment or a donation? If it’s an investment, does it really count as philanthropy? I don’t want to take the wind out of the sails of a project that I hope succeeds. But let’s be clear when something is philanthropic and when it is a straight-out investment. 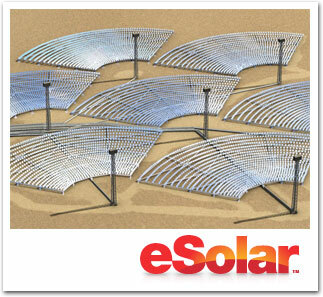 eSolar’s goal is to create renewable energy at a price that is cheaper than that created from fossil fuels. The clean technology industry is big business and a smart investment, not philanthropy. Credit to Google for putting its money where its mouth is, though — their Mountain View, CA offices use a 1.6 megawatt (MW) solar panel installation that generates 30% of the power used by those buildings, and I’m aware of a bunch of other programs aimed at reducing Google’s carbon footprint to zero. Read more about solar thermal energy here, here and on Google’s RE<C (Renewable Energy Cheaper Than Coal) page.